Control box and whisker circle size? Is there a way to have tighter control over the circle size on box plots? 1. Re: Control box and whisker circle size? 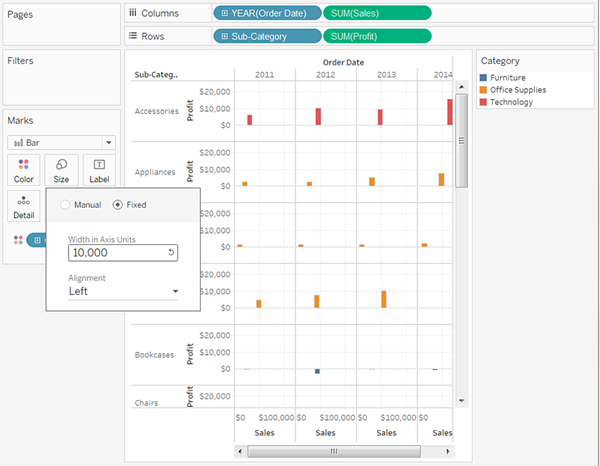 For views where the mark type is Bar and there are continuous (green) fields on both Rows and Columns, Tableau supports additional options and defaults for sizing the bar marks on the axis where the bars are anchored. The bar marks in histograms are continuous by default (with no spaces between the marks), and are sized to match the size of the bins. See Build a Histogram for an example. When there is a field on Size, you can determine the width of the bar marks on the axis where the bars are anchored by using the field on Size. To do this, click the Size card and select Fixed. When there is no field on Size, you can specify the width of the bar marks on the axis where the bars are anchored in axis units. 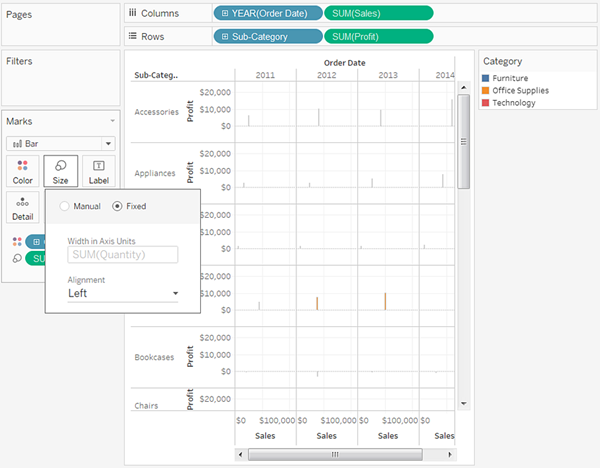 To do this, click the Size card, choose Fixed, and then type a number in the Width in axis units field. Please Mark Correct & Helpful if it works for you. 2. Re: Control box and whisker circle size? I would love to mark this correct and helpful, but I am still confused. I do not have a variable on the size mark. All marks are the same size. Further, when I right click and show size legend, the button is greyed out. Here you can see that the circle sizes are different in each worksheet, but it is very hard to coordinate the sizes between each worksheet. 3. Re: Control box and whisker circle size? Once you'll have variable into the size marks then only you can do this. Else if you can then please post .twbx file so that people could help you better way & properly. 4. Re: Control box and whisker circle size? Is this what you were looking for?? here i have dragged the measure on the size mark. 5. Re: Control box and whisker circle size? In my main workbook, I tried adding a constant measure to the size, but I still do not get the 'fixed' option in the dialog, and when I show size legend I get the same slider dialog, when I would really just like to enter a width value. I think the reason for this is my axis is categorical, not numerical. 6. Re: Control box and whisker circle size? Thank you for your reply Meenu, but I actually want all the dot sizes to be the same, and not just within one sheet, but across multiple sheets. 7. Re: Control box and whisker circle size? "Fixed" option is there only for "continuous axis". You can refer the answer by suman kumar. I have tried to create new "box and whisker plot" using your data and see the result below. All circles are of same size. 8. Re: Control box and whisker circle size? Thank you Meenu, this is what I'm looking for, the only thing I need is the choice between the size of the dots, and this is very hard to accomplish when I am using a slider control like below. For example, if I wanted the size at either of the red spots, it would be very difficult to sync between four sheets exactly. Do you have any advice for ensuring they are all the exact same size but when I don't want the size to be the minimum, maximum, or at one of the notches?